In our previous exposé of Summerlea folks we saw Marion Golden and Janet Smart and others making pastry and pie shells on July fourth. 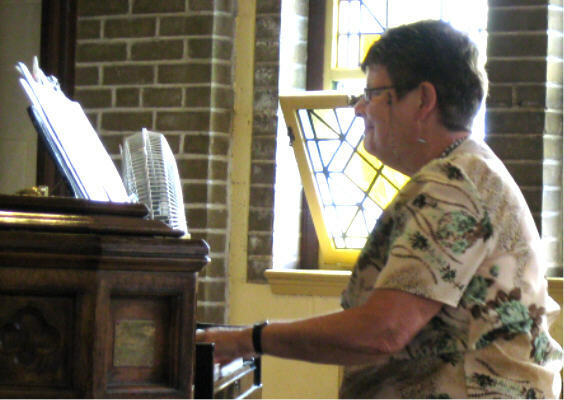 On July 20th, we found Janet and Marion playing the piano for the Sunday service, replacing Mark Bibeau of St. Andrew's United, who could not be there because his mother was in hospital. 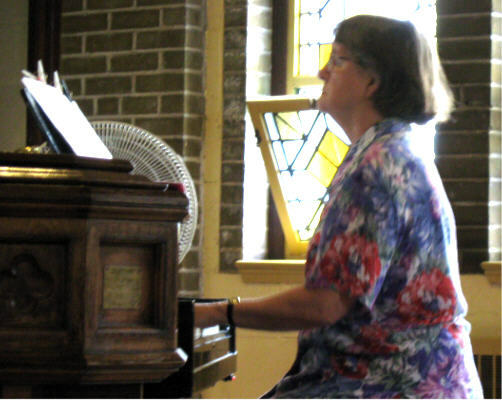 Janet played the prelude and the postlude. Marion played the hymns. And very well they did, indeed. Is there anything these ladies cannot do? Here they are at the keyboard. The snapshooter's location was not ideal, with the baptismal font in the foreground and the bright window behind, but perhaps you'll get the idea. Janet Smart on prelude and postlude, and Marion Golden on hymns.